After successful firings with Coil Gun 1A, I decided to build a second, higher energy prototype coil gun. It still is a single stage coilgun, but with two times the power of my previous prototype. The goal is to achieve higher projectile speeds with more power and using a flash tube as a switch. 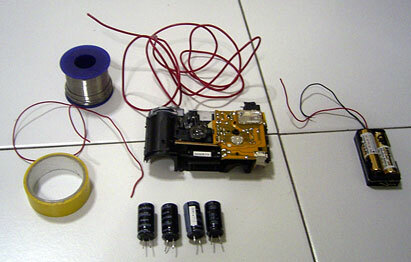 Various components used in making Coilgun 1B. Thin wire for battery connections and charging wires to capacitors. Thicker wire for current discharge into the coils to reduce resistance. Insulating tape to insulate exposed connections which may cause a short. Reel of solder for size comparison. 4 photoflash capacitors taken out from other disposable cameras, and the circuit board of the charging unit. I decided to use the same type of capacitors as Coil gun 1A, but more capacitors - 4 electrolytic photoflash capacitors wired in parallel and fitted inside a disposable camera as a base. All capacitors are rated 330VDC and store 120uF charge each. This amounts to 330^2 x 0.5 x 0.00012 = 6.534 joules each and around 26 Joules total. The power is little, but 16Js can be lethal! 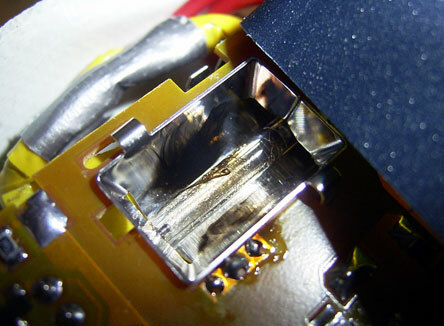 The capacitors are charged using the charging circuit which came inside the disposable camera unit. However, the little power supply takes extremely long to charge 4 times its rated amount, so I wired 2 batteries, instead of 1 battery to increase charging speed. All capacitors stuffed and wired up inside the casing. Unlike Coil gun 1A, I decided not to use a spark-gap switch. Spark gap switches are loud, and has two exposed electrodes directly connected to the capacitor bank, which is dangerous. Furthermore, it takes two hands to activate. Therefore, I decided to use the flash tube as a trigger. Although inefficient, it will allow me to use a single button push trigger, and will be quiet. I was rather concerned about sending so much power (4 capacitor instead of 1) through it, but it held up well. The first flash-tube actually exploded probably due to overheating (picture on below), but subsequent tests allowed to tube to cool for a while before further firings. Although inefficient, it is cheap and easy to make. Two different coilforms were made. Using the same design as coilgun 1a, I used slightly thicker wire, with more turns, around a pen tube. The projectile is just a piece of metal. It didn't perform very well, so I proceeded to build a second coil... The second coil had more layers, but as shorter, and the barrel was an ink-tube. The projectile is a small wood nail with the head cut off. This finally produced better results a the nail had power to pierce through 1 sheet of news paper, or stick into Styrofoam. Coilgun 1B with the first and second coil. Click HERE to watch a 204kb .wmv video (Windows Media Player required to play) of the assembled prototype firing at full power. (or you can right click, save target as). Here, the projectile is being shot at a styrofoam board. The flash is caused by the flash trigger. I love the fact that it is totally quiet when firing! Enjoy the video!